University of Toronto researchers have derived inspiration from the photosynthetic apparatus in plants to engineer a new generation of nanomaterials that control and direct the energy absorbed from light. Their findings are reported in a forthcoming issue of Nature Nanotechnology, which will be released on July 10, 2011. The U of T researchers, led by Professors Shana Kelley and Ted Sargent, report the construction of what they term "artificial molecules." 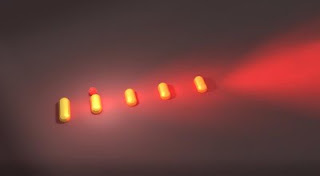 "Nanotechnologists have for many years been captivated by quantum dots – particles of semiconductor that can absorb and emit light efficiently, and at custom-chosen wavelengths," explained co-author Kelley, a Professor at the Leslie Dan Faculty of Pharmacy, the Department of Biochemistry in the Faculty of Medicine, and the Department of Chemistry in the Faculty of Arts & Science. "What the community has lacked – until now – is a strategy to build higher-order structures, or complexes, out of multiple different types of quantum dots. This discovery fills that gap." The team combined its expertise in DNA and in semiconductors to invent a generalized strategy to bind certain classes of nanoparticles to one another. "The credit for this remarkable result actually goes to DNA: its high degree of specificity – its willingness to bind only to a complementary sequence – enabled us to build rationally-engineered, designer structures out of nanomaterials," said Sargent, a Professor in The Edward S. Rogers Sr. Department of Electrical & Computer Engineering at the University of Toronto, who is also the Canada Research Chair in Nanotechnology. "The amazing thing is that our antennas built themselves – we coated different classes of nanoparticles with selected sequences of DNA, combined the different families in one beaker, and nature took its course. The result is a beautiful new set of self-assembled materials with exciting properties." Traditional antennas increase the amount of an electromagnetic wave – such as a radio frequency – that is absorbed, and then funnel that energy to a circuit. The U of T nanoantennas instead increased the amount of light that is absorbed and funneled it to a single site within their molecule-like complexes. This concept is already used in nature in light harvesting antennas, constituents of leaves that make photosynthesis efficient. "Like the antennas in radios and mobile phones, our complexes captured dispersed energy and concentrated it to a desired location. Like the light harvesting antennas in the leaves of a tree, our complexes do so using wavelengths found in sunlight," explained Sargent. "Professors Kelley and Sargent have invented a novel class of materials with entirely new properties. Their insight and innovative research demonstrates why the University of Toronto leads in the field of nanotechnology," said Professor Henry Mann, Dean of the Leslie Dan Faculty of Pharmacy. "This is a terrific piece of work that demonstrates our growing ability to assemble precise structures, to tailor their properties, and to build in the capability to control these properties using external stimuli," noted Paul S. Weiss, Fred Kavli Chair in NanoSystems Sciences at UCLA and Director of the California NanoSystems Institute. Kelley explained that the concept published in today's Nature Nanotechnology paper is a broad one that goes beyond light antennas alone. "What this work shows is that our capacity to manipulate materials at the nanoscale is limited only by human imagination. If semiconductor quantum dots are artificial atoms, then we have rationally synthesized artificial molecules from these versatile building blocks."